Before reading any further, a great deal of the following information has been supplied to me by owners of Red Submariners and my sincere thanks go to all of them. From the information supplied I have attempted to clarify the many questions that surround this model and glean a definitive time scale for the various events within its history. However, definites in this world are few and far between, and the history of Rolex watch production is not one of them. Simply put the Red Submariner, allocated Model number 1680, was on of the first Rolex Oyster Perpetual Submariners that incorporated a date function. I say one of the first Submariners as the 1680 Submariner was produced in two guises. The earlier models had the word Submariner written in red and the later in white. 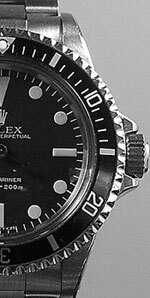 Up to this point the Submariner, having been produced for over 10 years with differing model numbers, had never had a date function. It was not the first Rolex Sports watch to carry a date, this honour arguably goes to the Rolex GMT Master, Model # 6542, but many collectors still choose to seek out this watch. This is undoubtedly because of some or all of the Red Submariners many features; a bi-directional bezel, a matt dial with tritium luminous material applied directly to its surface, a thick synthetic plastic crystal, a date feature, a chronometer rated movement and of course its increasing rarity. One of the many questions that are asked about the Red Submariner has to do with the length of its production run. The general school of thought is that production for the 1680 submariner was approximately 1966 to 1980 when it was superseded by the first sapphire crystal equipped Submariner, 16800. Within this 12 year period the Red Submariner is widely believed to be produced for the first 6 years, ‘66-‘73. Although this would seem equal in length to the later White Submariner (‘73-‘80), it must be remembered that many original Red Submariners have now been serviced and as such, many would have had their original red dials replaced with the standard white dials. Although it has been said that it was between ‘66-‘73, this cannot be certain. There are at least two issues that throw some doubt on this statement. 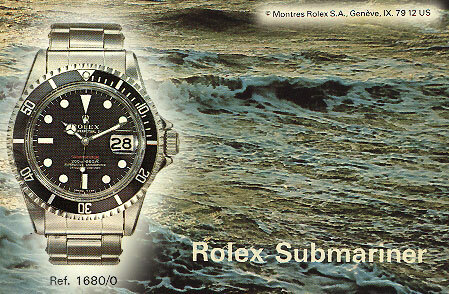 The first being the existence of various publicity photos of this watch being used to publicise the Submariner as late as 1979, 6 years after the supposed white Submariner had been introduced. For example a Bucherer catalogue (a leading Swiss seller of Rolexes) dated January 1974 show the Red variety of Submariner and similarly National Geographic magazines dated November 1975 carry Rolex adverts showing the Red Submariner. I believe that these photos do not represent the actual watch being produced at the time. Rolex, or their advertising agencies, were simply using stock photographs to show the Submariner and whether the writing was in red or white was academic, at the end of the day the picture was of a 1680 Submariner, the watch being produced and sold at the time. To find some explanation for this we need to turn to the modern day watch booklets. If you look at one of the more recent booklets for the Explorer watch you will clearly see two different Explorer II models pictured. The main picture is of the 16570 model, but the watch that is used to demonstrate the crown settings and 24 hour function is clearly the earlier 16550. Production of this model was stopped in approximately 1989 and therefore, if we accept that Rolex are using stock photographs now, it seems plausible that they were using them back in the 1970‘s also. More difficult to explain however is a discrepancy to the ‘66-‘73 production run that becomes apparent only when reviewing the replies from Red Submariner owners, the great majority of whom report having bought their watch during this period. The thing is some owners contend that their watch has a 5 or 6 million serial number indicating a production date somewhere in the late 1970’s! Furthermore they insist that they have owned the watch since new and that they have had neither had a dial nor a case change. As it stands at the moment the one explanation I can give, if we are to hold with the 6 year production run, is tenuous. At this time Rolex were not producing their own dials, they bought them in from other manufactures. It may be possible that these manufactures made a batch of dials to the original specifications, stored them away only to rediscover them latter. They were subsequently sent out to Rolex who used them, as they were perfectly good submariner dials, and hence the late serial numbers. I said it was tenuous! Another possible explanation that has been mentioned by other collectors, and one far more credible, is that different geographic markets were supplied with slightly different specified watches. The only way to know for any certainty is to know the original county to which these watches are supplied. Information that at this time that I do not possess. Another question that is asked is to do with the depth rating on the dial, namely what importance is there to the way this is set out? I had originally assumed that the earlier models carried the format of putting the meters first and at about 1969 this was reversed with the feet coming first but I have since seen a Red Submariner that showed the depth rating with the meters first even though the serial number of the watch indicated a production date of 1973. As to the reason for the format difference are two possible explanations. The first being that having the larger number first gives the watch the appearance of being more suitable for deep diving. As Rolex are always aware of their marketing they may have seen this public conception early in the Red Submariner production and altered their dial accordingly. A second possible explanation may be that the depth ratings were subject to regional variations. Certain countries may have preferred their measurements in metric as opposed to imperial. The last question is why did Rolex produce the red writing Submariner at all. The red Submariner was not the first or last red line Rolex to have been produced. There have been early Datejusts, early Explorer dates, the initial batch of single and double red Sea-Dwellers and the current full size Yacht-Master. Perhaps it was to commemorate the introduction of a new model, but this is just a hunch. What I have been able to find out was one explanation of why the change from red to white. The reply to this question was: ‘No special reason, they just did’. How much credence I can give to this explanation is debatable. Probably as much as I give to my own!